Who Goes There? The Huguenots! At the age of 25 Louis-Désiré Véron became a doctor of medicine and went on to work in Paris hospitals for a few years. But he did not enjoy a great career as a doctor. One’s position in the medical world at the time was determined not only by knowledge and skills (Véron wasn’t lacking in this department; he even published a monograph on the treatment of oral thrush in infants), but primarily by wealth. Véron did not come from a rich family, nor did he have an endearing appearance. But he did have a flair for business. After the death of an apothecary, he took over the patent for making cough candies and made quite a fortune. In 1829 he founded the literary magazine Revue de Paris, whose collaborators included Eugène Scribe, a master of pièce bien faite, one of the most talented, influential and prolific librettists in the history of opera. Two years later Véron acquired a franchise for the Paris Opera, privatised by the government of the July Monarchy. He admitted openly that he knew next to nothing about music. But he knew whom to ask for advice and, above all, he had an excellent sense of public feeling. The five years of Véron’s directorship is regarded as the beginning of the golden era of grand opéra – a time when the Parisians’ collective imagination was moved by the compositions of Auber, Meyerbeer and Halévy, the dazzling set designs of Henri Duponchel and the phenomenal voices of Adolphe Nourrit and Cornélie Falcon. It began with the premiere of Robert le diable, after which Chopin announced the birth of a masterpiece of a new school, while Słowacki enthused in a letter to his mother, “never in my life have I seen such a big church like the one created by the theatrical illusion”. Encouraged by this success, Véron commissioned Meyerbeer to write another opera, Les Huguenots, loosely based on Prosper Mérimée’s Chronique du règne de Charles IX. Work on the piece lasted nearly five years. At that time Meyerbeer was well-established as a composer and had amassed a considerable wealth, so he could afford the luxury of unprecedented source studies (he began with in-depth studies of 16th-century musical manuscripts), hiring two librettists, Eugène Scribe and Émile Deschamps, and consultations with Gaetano Rossi, with whom he had earlier worked on his Il crociato in Egitto (1824). The premiere took place after Véron’s resignation as director of the Paris Opera, on 29 February 1836. It was an even bigger triumph than that of Robert le diable: even envious fellow composers not always well-disposed towards Meyerbeer proclaimed Les Huguenots to be the crowning achievement of the genre, although Berlioz could not resist a snide remark that the score resembled a “musical encyclopaedia” and that there was enough material for ten separate operas. Three years later the work was presented on the other side of the Atlantic. It was staged all over the world, sometimes with different titles to avoid religious conflicts. After several productions in the Soviet Union a suggestion was made to adapt the libretto and turn Les Huguenots into an opera about the Decembrists, but the idea was never put into practice. In the 1890s the opera was presented at the Metropolitan Opera as a “night of the seven stars”, with the cast including the likes of Lilian Nordica, Sofia Scalchi, Reszke brothers and Pol Plançon. The thousandth performance at the Paris Opera took place in May 1906; over the next three decades the opera was performed 118 more times and then it disappeared from the capital for over eighty years. Why? It is commonly believed that staging this monster requires an incredible amount of effort, while finding a decent Raoul borders on the impossible. Indeed, we are well past the glory days of grand opéra, a time when the principal tenor earned twenty-five thousand francs a year, the principal conductor three times less, and the minor members of the corps de ballet had to resort to prostitution in order not to starve. Indeed, the last tenor capable of singing all the high notes in the main role of Les Huguenots cleanly, freely and in full voice may have been the late lamented Franco Corelli. Yet this does not change the fact among all the composers of the genre Meyerbeer has suffered the most at the hands of history, and his operas began to return to the stage only in this century. It seems that this was caused not only by musical factors – but also by a systematic rise of anti-Semitism in France, from the Dreyfus Affair to the establishment of Vichy France. After the war grand opéra declined rapidly and is only now recuperating. 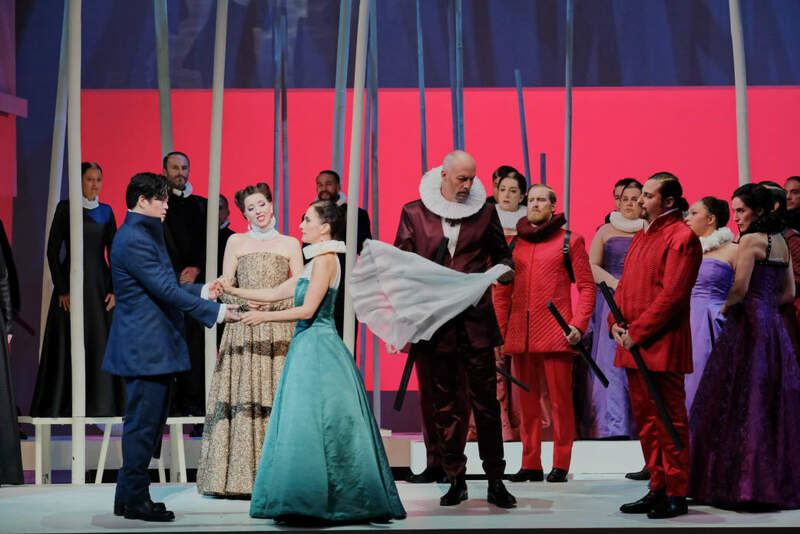 Meyerbeer’s turn came last – it is good that his famous Les Huguenots opened the 350th anniversary season at the Paris Opera, organically linked as it is to the very term of grand opéra. 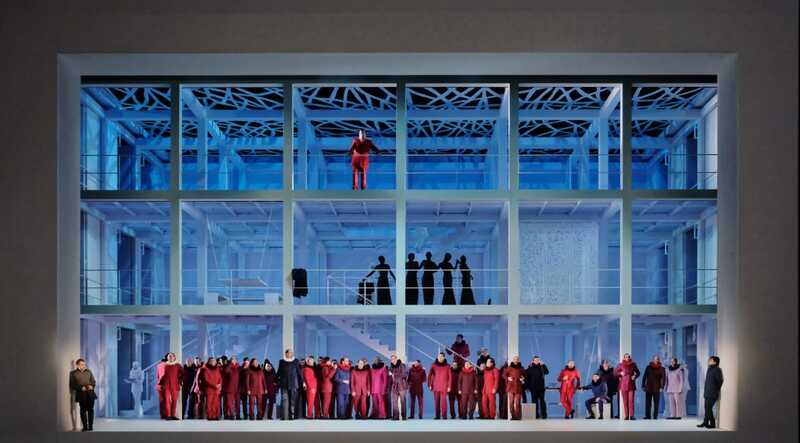 The staging was entrusted to Andreas Kriegenburg, the famous self-taught German director (a carpenter by profession and former member of the technical staff in Magdeburg), who acquired most of his directing experience in drama theatre. He got into opera more or less ten years ago, but has been quite active in the field, recently mainly in Dresden and Munich. Kriegenburg regards himself not as a deconstructionist but as a storyteller, although – as he confessed in a conversation with Iwona Uberman – “I don’t want to be just a servant to the author, I prefer to decode the spirit of the play and present it on stage, looking at it from my perspective and through myself as a person. In fact, I always try to get closer to a work, even when I seemingly go further and further away from it.” It sounds a bit non-committal – as does, in a way, the Paris production of Les Huguenots. Apparently played out in a not too distant future (at least as that is what is suggested by the director’s prologue before the curtain rises), but, in fact, it happens everywhere and nowhere, in Harald B. Thor’s minimalist decorations and Tanja Hofmann’s historicising costumes. There would be nothing wrong with this, if Kriegenburg had not overdone the Brechtian Verfremdungseffekt and instead had gone a little deeper into the meaning of the work. The result? The director’s cold, calculated vision clashed painfully with the powerful emotions of the score. Kriegenburg likes to work with the bodies of the actors and re-enact certain situations ad nauseam with the persistence and tenacity worthy of Marthaler – so he has turned Les Huguenots into a nearly four-hour abstract ballet, pushing into the background not only credible psychological portraits of the protagonists but also the narrative itself. Before I sussed out who was who at the great feast at Count of Nevers’, I was half an hour into Act I. Act III began quite coherently, but ended grotesquely: the Catholics and the Protestants whacking each other looked more like school girls from good families fighting with their dainty umbrellas. The idea of turning cold steel in the famous Blessing of the Daggers scene (“Gloire, gloire au grand Dieu vengeur!”) into a phallic symbol and making the oath resemble an act of collective masturbation would not perhaps be so stupid, if it were not for one tiny detail – the scene lasts for more than a quarter of an hour. We know Kriegenburg’s penchant for slapstick and convention breaking, but the St. Bartholomew’s Day massacre in the finale was too suggestive of Peter Sellers and his immortal portrayal of Inspector Clouseau in The Pink Panther. However, there were some gems as well: for example, the horribly dynamic death of one of the victims of the massacre, who, after being struck with a sword, begins to spin on the upper platform like a balloon, broken free and suddenly pricked. Alas, concepts that work well in postdramatic theatre fall flat in opera – I’m afraid that the spinning girl may have been missed by many spectators. I have to admit, however, that Kriegenburg’s staging proved fairly innocuous and did not spoil the musical side of the performance. And there were things to worry about, because the production seemed to have been cursed. 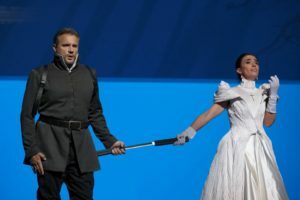 In August Diana Damrau cancelled her appearance as Marguerite de Valois and less than two weeks before the premiere Bryan Hymel withdrew from the fiendishly difficult role of Raoul. My suspicion is that both replacements were a blessing for the Paris Huguenots, though the results are difficult to compare. With her crystal clear, technically immaculate and very agile soprano Lisette Oropesa brought the entire house down. The audience was less enthusiastic about Yosep Kang, brought at the last moment from Deutsche Oper Berlin – unjustly, in my opinion, because he coped with the role of Raoul well, both when it came to singing and acting, with his ringing tenor heroic in colour and beautifully rounded in the middle register. True, he played it safe with the high notes and they were not always clean, but this stemmed primarily from nerves and overuse of his vocal resources during rehearsals and successive performances. That Kang is well aware of his shortcomings and knows how to mask them cleverly was evidenced by how he phenomenally paced himself in the lovers’ duet from Act IV (“O ciel, ou courrez-vous?”). As Valentine, Ermonela Jaho was less impressive – she was excellent acting-wise, but has a voice that is too light and too lyrical for the role, written for a soprano falcon (incidentally, Raoul’s beloved was first sung by Cornélie Falcon). Karine Deshayes was a magnificent Urbain. The French singer, who started out in Baroque music, has a lovely, even mezzo-soprano that deserves far more appreciation from international opera companies. It was more difficult to find real stars among the men: those deserving an honourable mention were certainly the bass-baritone Nicolas Testé, who despite some deficiencies in the lower register was convincing as Marcel; the velvety-voiced baritone Florian Sempey as Nevers and the bass Paul Gay as Saint-Bris, perhaps not expressive enough but with a very elegant sound. Worthy of note is also Cyrille Dubois, a singer at the beginning of his career: a fine actor and typical “French” tenor, who appeared in the episodic roles of Tavannes and First Monk. 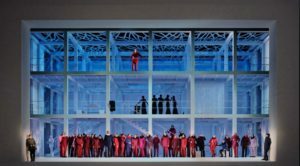 The man in charge of the last performance was Łukasz Borowicz – his appearance at the conductor’s podium at the Bastille should be remembered as historic for at least two reasons. Firstly, no other Polish conductor had led the orchestra of the Paris Opera before. Secondly and, in my opinion, more importantly – Borowicz, despite participating in the seven-week rehearsals before the premiere, working diligently with the soloists, conducted the performance having had not a single orchestral rehearsal. Michele Mariotti, the music director of the production, must have trusted him immensely – irrespective of Diana Damrau’s earlier recommendation. I cannot really compare the conducting of the two gentlemen, but after what I heard during my one-day visit to Paris, I am convinced that Borowicz has an excellent feel for Meyerbeer’s idiom. He led the soloists and the Opera’s fine chorus and orchestra with a firm hand, not for a moment losing the inner pulse and brilliantly highlighting the constant play of contrasts in the work as well as its sometimes not very obvious innovations (for example in the Blessing of the Daggers scene, in which the voices of six soloists alternately come together and emerge in smaller ensembles, cutting through the orchestral fabric with a cappella fragments only to push through the orchestral tutti with a powerful chorus in the reprise. I hope this was not Borowicz’s only appearance at the temple of grand opéra. Waiting for the next ones, I will happily watch him in other productions of Meyerbeer’s masterpieces, especially my favourite Robert le diable. One thing worries me, though: that I will have to leave Poland to do that. I like travelling. But I’m fed up with having to escape from the daily mediocrity of our domestic opera companies.